There is just so much to see nearby Tetbury and Oak House No.1, but in even a few days you can see a wide selection that the Cotswolds area has to offer. Of course Prince Charles’s Highgrove Garden Tour should be top of any list, just 3 minutes up the road from Oak House No.1, Highgrove is a very special treat. The garden tour gives a great insight into Prince Charles’s vision for a garden that he created from scratch over the past 30 years. We have a short tour of the Cotswolds which you can drive easily in one day, taking in all of the most beautiful Cotswolds villages and lovely countryside between. There is Westonbirt National Arboretum just 5 miles away from Oak House No.1, a must visit in Summer or Autumn when the Japanese Maple collection is in full colour. It should be remembered that Bath is only 35 – 40 minutes away and this Georgian World heritage site is truly stunning. With the first bleats of new arrivals and the anticipation of many more in the air, lambing is our favourite time of year! The Introductory Day is designed to provide you with a greater understanding of the basics of falconry. You will cover the basics of falconry on this day and an awful lot of ground is covered so prepare for mental indigestion!. Luxury hotel Oak House No.1 here in Tetbury is a great base for exploring the Cotswolds and this month there are a couple of very interesting exhibitions for all lovers of art. A lover of art and talented artist, Winston Churchill (born at Blenheim Palace in 1874) spent much time painting the vistas of the palace, along with inspiring places that he visited during his lifetime. This new exhibition will feature a collection of Churchill’s original paintings on display in the Long Library. Leonardo da Vinci: A Closer Look is a new book revealing hidden details in the artist’s drawings. The publication also coincides with the opening of twelve simultaneous UK exhibitions of drawings (including Bristol) from the Royal Collection to mark the 500th Anniversary of his death. The book is £29.95 from royalcollectionshop.co.uk. It’s Cheltenham Festival this week, Cheltenham Racecourse presents Four Days amazing days of racing, including the pinnacle Jump racing event of the year, an event with an atmosphere that will make the hairs on the back of your neck stand up. Oak House No.1 is your luxury hotel in the Cotswolds whilst visiting Cheltenham. Westonbirt Arboretum – forest tour featuring Paul Weller dates announced. Paul Weller is to play again at Westonbirt Arboretum on Friday 14th June. Oak House No.1s your luxury hotel in the cotswolds and just 5 minutes away from Westonbirt Arboretum, in fact many of our past guests have attended concerts at Westonbirt and walked back later in the evening. We are very pleased to announce that we are supporting a breast cancer charity by donating an auction prize of a one night stay in our very best suite on the Friday evening of Paul’s concert, a charity organised by Nicky Weller, Paul’s sister and my cousin. Unusual to see our guests sitting in the garden in February ! with the sun shining in a secluded corner you could think summer has come. Just two weeks until Valentines Day ! With just two weeks until Valentines Day there’s still time to book a great romantic weekend away at Oak House No.1. Imagine lovely walks over fields here in the Cotswolds, ending up at a welcoming country pub for lunch and a pint, then returning back to Tetbury and the comfort and glamour of Oak House No.1. We have a range of Hunter wellies for you to use, catering for all sizes so there’s no excuses however muddy the fields may be ! The Sunday Times to feature luxury hotel in the Cotswolds, Oak House No.1 again ! The Sunday Times will feature our Cotswolds luxury Hotel, Oak House No.1 in their upcoming article about best ‘romantic places to stay’ for Valentines day. Our most romantic suite and without doubt the most glamorous hotel suite in the Cotswolds is The Cavalier Suite here at Oak House No.1, which has very recently had a makeover. Here you will find a spectacular bespoke made 4 poster bed draped with the finest silk bedding and curtains, very special Mark Brazier Jones bronze furniture and even a collection of Murano ‘art glass sculptures’. The suite is probably unsurpassed throughout the UK with it’s quality fittings and objets d’art. What do Meghan Markel and Prince Harry have in common with Cotswolds luxury hotel, Oak House No.1 ? Meghan Markel and Prince Harry surely copied what Nicola and Gary (owners at Oak House No.1) wore in Monaco some three years earlier when choosing their evening wear after their wedding at Windsor Castle. Meghan Markel and Prince Harry surely copied what Nicola and Gary wore in Monaco three years earlier for their choice of evening wear after their wedding. The Sunday Times calls Cotswolds luxury hotel, Oak House No.1 a ‘romantic couples getaway’, the perfect retreat for a cosy Valentines weekend. Christmas is just a distant memory, but it’s time to turn our thoughts to love – and there’s absolutely no better place to celebrate Valentine’s Day than the beautiful Cotswolds. Whether you’re looking for fabulous food and drink, cosy country pubs with or romantic walks through our gorgeously scenic countryside – it’s all here waiting for you. In this long winter period it’s good to remember lovely summers days in the garden at Cotswolds luxury hotel, Oak House No.1. Many of our guests take afternoon tea here in the garden either when returning from a short tour around the beautiful Cotswolds villages or just a fun time hunting around the many antique shops in Tetbury. Here’s how one guest describes Oak House No.1 …..” When Alice arrived in wonderland and Doctor Parnassus invented his imaginarium, they must have been here. Where designer opulence collides with creature comforts, where art, creativity, rock and roll and inspiration drips from the walls, where glitz and glamour meet tradition and taste. Receive the warmest of welcomes , A stand alone experience, second to none”. The Cavalier Suite at Cotswolds luxury hotel, Oak House No.1 has received a makeover this week making it even more opulent and surely the most glamorous hotel room in the Cotswolds, if not the whole UK ! The Cavalier bedroom itself is enormous, featuring a sumptuous bespoke made, silk draped four poster bed, collectable Mark Brazier Jones furniture (collected by Madonna, Brad Pitt, Sylvester Stallone, Sir Mick Jagger and many others) and even a collection of Murano glass art from Venice. There is a Library sitting room attached across the corridor in the suite with two armchairs and a large screen tv, all this and a huge bathroom with bath tub with in wall tv and separate rain shower. Many exclusive London hotels cannot boast the level of quality of this suite, truly a special occasion destination. The Cavalier Suite is just one of the reasons why the Sunday Times (Travel) named Oak House No.1 in their ‘Ultimate’ 100 UK hotels. Here are some of our favourite reviews over the past few years, they come from customers around the globe and each for us are a great memory with interesting new people. We hope that you will gain a good idea of what Oak House No.1 is all about from these few reviews, we can only thank all those guests who have taken the time to write something for us and must add that each and every one is remembered fondly. Come visit Cotswolds luxury hotel, Oak House No.1 and sample breakfast in style in our opulent dining room complete with Christmas tree. Regularly voted as one of the most popular Christmas Markets in the UK, the 18-day shopping extravaganza provides a magical shopping experience,. There are over 180 beautifully decorated chalets offering high-quality, artisan products. Bath Christmas Market is proud to be distinctively British, with over 80% of stallholders coming from Bath and the surrounding region, and 99% of products handmade in Bath, the UK or overseas with Fairtrade certification. This year, Bath Christmas Market are working with Christine Leech, Creative Director of Marie Claire Runway Magazine, to transform discarded single use plastics into creative Christmas decorations, with the help of local pupils of Widcombe Junior School. Don’t miss the Market’s all-new festive shopping area on Milsom Street. Browse the chalets lining the street, admire the stunning Christmas lights, soak up the festive atmosphere, and sample warming mulled wine and mouth-watering winter food offerings. The Telegraph Travel selects Luxury Cotswolds hotel Oak House No.1 as one of the best places to stay in the Cotswolds. We are so pleased that the Telegraph has chosen Oak House No,1 as one of the best places to stay in the Cotswolds especially as we respect their opinion and the way that they conduct their reviews. The newspaper always sends round an independent reviewer to do the interview and no freebies are ever required, like meals or stays, this ensures a totally unbiased appraisal of each hotel. The Prince of Wales’s Charitable Foundation was established by The Prince of Wales in 1979. The Foundation operates primarily as a grant making trust and aims to use income raised from its trading subsidiaries to support charitable causes and make a strategic impact for good. You are not just having a fun morning shopping at Highgrove but also donating to the Prince’s trust. Christmas shopping doesn’t get better than this. Enjoy a warm welcome to Highgrove with a glass of complimentary champagne and a festive cream tea in the restaurant. Including a freshly baked scone with clotted cream and jam, you’ll be able to catch-up with friends and family before finding an array of unique gifts in the Highgrove Christmas Fair. Remember that Cotswolds luxury hotel, Oak House No.1 is just minutes away in Tetbury, so why not make your visit even more special. Lighting Tetbury up once again on Friday 7 December 2018, the annual Lights Switch On will include celebrity appearances, festive music and the chance to visit Santa in his grotto. Father Christmas will lead the torch light procession and join in with some Christmas carols this December. As well as that, Coronation Street star, Robert Preston, will be switching on the lights. Festive market stalls, late-night shopping and a Christmas drink or two promise to make for a great start to festive season. Cotswolds luxury hotel, Oak House No.1 is set perfectly in the heart of this area of outstanding natural beauty and the run up to Christmas is a great time to visit. There are old fashioned inns and gastropubs, some of the best things about the Cotswolds and you’ll never be too far from a traditional pub with old world charm and a roaring fire. This is the perfect time to cosy up with a glass of wine and great food. Some of the best pubs with open fires in the Cotswolds include The Wheatsheaf Inn in Northleach, The Kings Head Inn in Bledington, The Potting Shed in Malmesbury, The Wild Duck Inn in Cirencester and The Ebrington Arms in Chipping Campden. Cotswolds luxury hotel Oak House No.1 is perfectly situated to visit some of the most spectacular displays of Christmas/winter lights in the country, from ‘The Enchanted Christmas’ at Westonbirt Arboretum to the magnificent Blenheim Palace lights trail from the 23rd Nov 2018. The Blenheim Palace winter trail will be brighter than ever before with lasers, projections, and thousands of pea-lights. From the delicate and twinkling to the grand and spectacular, the Formal Gardens will light up once again for a festive journey of exploration and wonder. Wander beneath unique tree canopies drenched in seasonal colour, shards of light, frosty snowflakes, stars and glistening baubles, and catch a glimpse of Santa and his elves along the way. Highlights include a new Field of Light, scented Fire Garden, Canopy of Light, and the mesmerising voices of the Singing Trees. Truly a magical winter wonderland awaits, this spectacular sight is not just the children but adults too, so get your season’s celebrations off to a great start and get into the spirit of this magical time of year. Experience the night-time magic of Sudeley through this beautiful new illuminated trail. Follow the White Rabbit and discover some of the amazing characters from Alice in Wonderland. You will be delighted at the glorious Field of Poppies, Meteors, Moroccan Lanterns and much more. Explore the new illuminated trail around the castle’s stunning grounds, with the majestic trees and romantic ruins all lit under the stars. Try traditional festive warmers of Mulled Wine and Hot Chocolate and tuck into festive food on the castle terrace. Birthplace of Sir Winston Churchill, Blenheim Palace is a World Heritage Site set in more than 2000 acres of landscaped parkland and Formal Gardens boasting over 300 years of history. Christmas at Blenheim Palace returns from 23 November, 2018 – 1 January 2019, illuminating England’s finest view with a bigger, brighter and more spectacular evening trail than ever before. As a vision of Britain, Tetbury is terribly seductive. I could fall for Tetbury. We could all fall for Tetbury. A town like they used to make them. A town untroubled much by the travails of modern life, like suburbs. A town seemingly composed entirely of the kind of picturesque, biscuit/fudge-coloured Cotswold buildings you see on biscuit tins and fudge packets. A town seemingly without troublesome poor people: Tetbury has been rich since the 15th-century wool trade. A town of antiques shops, boutique B&Bs and purveyors of chutneys and biccies: with cheese shops, butchers, bakers – is that a candlestick maker? – they don’t seem to be in need of Mary Portas round these parts. Yes, that’s Prince Charles’s shop, the Highgrove deli, over there. HRH Charlie is lord of the manor, though, alas, rarely on the tills at the shop. Some say Tetbury inspired Poundbury: both seem to exist in some kind of lovely la-la land. The Cotswold’s produces lots of great local foods and has more than its fair share of passionate artisans. A great way to spend a morning whilst on a holiday in the Cotswolds is the head to one of the markets and meet these producers, try some tastings and bring a few ingredients back. A top choice is the award winning Stroud Farmers Market every Saturday 9am – 2pm. Picking up Radio 4’s Best Farmers Market in the Country Award speaks for itself. Look out for our favourites stalls that include Cotswold cheeses and locally made pies! Then head back to your luxury hotel in the Cotswolds, Oak House No.1 for some more pampering. A full list of markets and days can be found in the ‘Food and Drink’ section of our travel guide: Cotswold Holiday Guide. Oak House No.1 is perfectly situated in the very heart of Tetbury, just moments away from the many restaurants and independent boutiques. During the winter season this small market town is transformed with glittering white fairy lights giving the place a cosy warm glow. Indeed our famous neighbours Prince Charles and Camilla came just five minutes up the road at Highgrove House to turn on the lights just a few years ago. If you are looking for a special winter break in the Cotswolds, Cotswolds luxury Hotel Oak House no.1 is the perfect place. We are situated just 35 minutes from Bath with it’s wonderful Christmas market and only 10 minutes from Prince Charles Highgrove House and Westonbirt Arboretum. There’s nothing quite like the charm of the honey coloured buildings on a cold and wintery day in the Cotswolds, just imagine wandering through stunning villages, dropping into warm cosy pubs and ending up in the evening at your luxury hotel in the Cotswolds, Oak House No.1. Bath Christmas market is a must, so why not come stay at luxury hotel in the Cotswolds Oak House No.1, from here you can visit all of the most lovely Cotswolds villages and are just 35 minutes from Bath. Oak House No.1 has been given the Recognition of Excellence Award by the worlds leading hotel comparison website Hotels Combined, with an amazing 9.9/10 customer rating. Cotswolds luxury hotel, Oak House No.1 is quite well known in China and we find it so interesting conversing with our Chinese guests. This week end we spent an especially nice time with mother and daughter Lann and Laura from Shanghai. There are s some beautiful colours in the gardens at the moment as the seasons begin to change. Cotswolds luxury hotel. Oak House No.1 is just 5 minutes away from Prince Charles’s Highgrove House, so do come stay and make your visit even more special..
Westonbirt Arboretum is on fire with splendid reds , yellows and oranges, yes the largest Japanese Maple collection in the UK has sprung into life. Westonbirt Arboretum has had a major revamp over the past few years to include a spectacular new sky walk through the trees. Our luxury hotel in the Cotswolds, Oak House No.1 is just a few minutes away so do make your visit even more special and treat yourself to some ultimate luxury. Our Cotswolds luxury hotel Oak House No.1 tends to attract clients with luxury cars, here’s some of the latest to arrive outside the house. Over the years every brand of luxury car has adorned our car park, from Aston Martin and Bentley to Rolls Royce Phantoms and Porsche Turbo’s. Some wonderful shadows over the garden at Oak House No.1 today. The long evening shadows make the garden so atmospheric. Thanks to Jessica Patterson for a wonderful piece on the Luxuria Lifestyle website this week. For all its iconic British beauty, the Cotswolds isn’t really the type of place to visit if you want to be surprised. You go to admire its unique upmarket-yet-pastoral appeal – honey-coloured cottages, rolling green fields and historic villages – and to amble along paths in mud-splattered wellies. But some places in the Cotswolds aren’t what you expect, and nowhere illustrates this better than Oak House No.1, a flamboyant, luxurious boutique hotel in the heart of Tetbury. From the outside this handsome house looks like your archetypal Cotswolds home, a picture of understated Georgian elegance – but step inside and you’ll enter another world. Westonbirt Arboretum – Best Autumn colour outside New England ! Westonbirt Arboretum just 5 minutes from Cotswolds luxury hotel, Oak House No.1. The trees have already started turning and a truly memorable show of intense colour will shine through soon. Westonbirt Arboretum is just 5 minutes away from Oak House No.1 and makes for a wonderful afternoon walking through the splendour of the park. The main attraction is the Japanese Maple collection, the largest in the whole of the UK. So come make your visit even more special with a stay at our Cotswolds luxury hotel, Oak House No.1. Bustling Christmas markets, stunning stately homes covered in twinkling lights and cosy pubs boasting roaring log fires – there’s no better place to be than the Cotswolds at Christmas. The Arboretum is holding an Enchanted Christmas event to celebrate the beauty of Westonbirt’s trees. Visitors can walk a one-mile illuminated trail and Father Christmas and his wife will be in attendance each evening to hand out gifts and tell seasonal stories. The event is running on the evenings of December 1, 2, 3, 7, 8, 9, 10, 14, 15, 16 and 17 and trails start from either 5pm, 6pm or 7pm, with each trail lasting one hour. Westonbirt Arboretum is just 5 minutes from Oak House No.1, so why not take a thrilling stroll around the illuminated grounds then head back to Tetbury and spend a luxurious evening at our Cotswolds luxury hotel. The Telegraph Travel selects Luxury Cotswolds hotel Oak House No.1 as one of the best places to stay in the Cotswolds. We are so pleased that the Telegraph has chosen Oak House No,1 as one of the best places to stay in the Cotswolds especially as we respect their opinion and the way that they conduct their reviews. Cotswolds luxury hotel, Oak House No.1 is to be featured in some very high end magazines this coming month, including, Town and Country, Luxury Lifestyle Magazine and Upscale Living Magazine. Over the years Oak House No.1 has featured in many Lifestyle and Interior design magazines from the UK to China. Early evening guided tour through the gardens followed by Pimm’s and a two-course dinner. A great chance to see around Prince Charles’s wonderful gardens created largely by his own design over the past 30 years together with the help of experts from around the globe. Of all Cotswolds luxury hotels, Oak House No.1 is the nearest being just a few minutes away from Highgrove House and the perfect place to make your visit even more special. 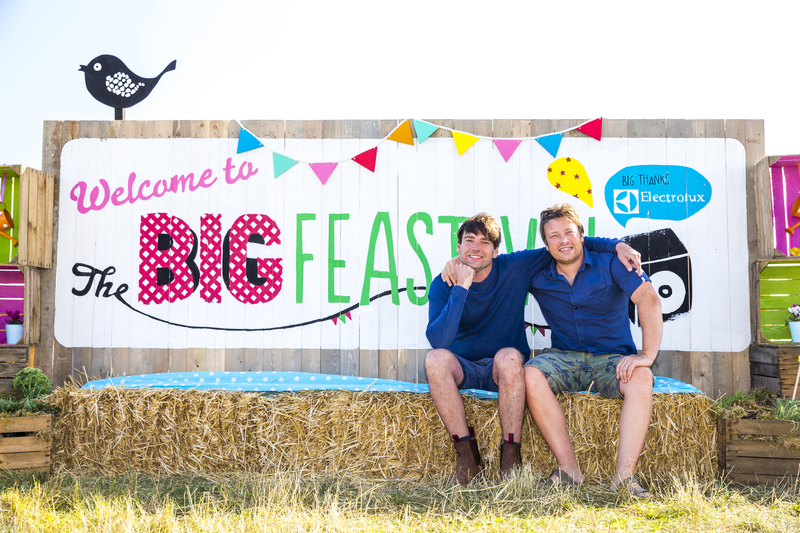 The Big Feastival at Alex James farm here in the Cotswolds is on again and this year has an exciting line up of musicians, chefs and entertainers for all the family, do take a look at the official website. Why not make it an even more special weekend break with a visit to award winning Cotswolds luxury hotel Oak House No.1. For book lovers, Cheltenham is the only one place to be this autumn. Whether you’re looking for the biggest names in fiction, politics, television, art, food or sport, The Times and The Sunday Times Cheltenham Literature Festival has it all, so why not make it an even more special trip with a stay at our luxury hotel in the Cotswolds Oak House No.1. Bath is just 35 minutes drive from Oak House No.1 and a great place to visit any time, but particularly special if you are a Jane Austen fan. 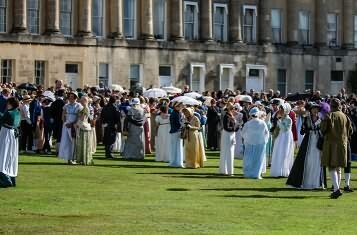 The 17th annual Jane Austen Festival in Bath. Two teams of players from Bourton Rovers Football Club indulge themselves in the crazy ‘sport’ of trying to get a ball through the water and past each other into the goal. Despite the huge amount of splashes, large numbers of spectators turn up – some carrying umbrellas to try to stay dry. If you are visiting the Cotswolds make your stay even more special at the most glamorous of all Cotswolds luxury hotels, Oak House No.1. You can take a quick tour from Oak House No.1 which takes in most of the beautiful Cotswolds villages and end up at Bourton on the Water for the spectacle of football played in the river. One of the world’s premier five day events. Set in the magnificent grounds of Blenheim Palace, at Woodstock, Oxfordshire, and with the Palace as the back drop for all main arena action, the horse trials offers a fabulous opportunity to see some of the world’s finest riders and their horses compete against one another in a truly spectacular environment. It’s time for the fantastic Womad festival this weekend at Charlton Park, so come stay at Cotswolds luxury hotel Oak House No.1 and have a sensational weekend. The Cotswolds’ year is packed with events, ranging from world famous international festivals like Cheltenham Literature Festival or Cheltenham Gold Cup Week to quirky events like the Cotswold Olimpick Games or Tetbury Wool Sack Races. There are major musical events like the Wilderness Festival, Cornbury Festival or the Big Feastival, as well a packed events calender featuring music, exhibitions, arts and literature festivals, theatrical productions. The Tetbury Woolsack Races take place on Gumstool Hill just behind Oak House No.1. The weekend of the races is a full on celebration here in Tetbury with street markets, food stalls and street entertainment as well as the totally crazy spectacle that is the Woolsack races themselves. Cotswolds luxury hotel Oak House is situated just one minute away. The Festival of British Eventing takes place at Gatcombe Park, the spectacular home of the Princess Royal and her family and incorporates the British Open, Intermediate and Novice Championships, as well as the Amateur Championship. Gatcombe Park is only 10 minutes away from Cotswolds luxury hotel Oak House No.1. The much loved Giﬀords Circus returns to The Barringtons in 2018 with a brand new tour – My Beautiful Circus. The Circus as an art form is 250 years old and Giﬀord’s Circus is celebrating! Expect to gasp at gravity defying acrobats, enjoy. Once again The BIG Festival is here again with an amazing line up of music, but that’s just the start as there are workshops, food stalls, craft stands, roaming performers and so much more. See the official website for more details and make your visit special with a stay at Oak House No.1 the most ‘rock ‘n roll’ of all Cotswolds luxury hotels. 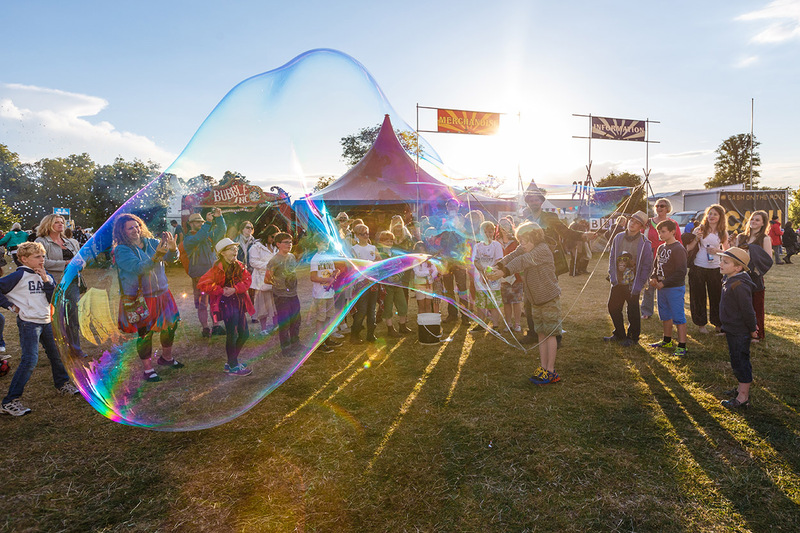 WOMAD’s UK home is in Charlton Park, Wiltshire, where every year, during the last weekend of July, you’ll discover a world without borders, a global fiesta of music, food, dance & art, and a place where everyone is welcome. Our first festival took place in 1982, and since then we’ve taken the party to over 27 countries and held over 250 festivals. We’re currently in Australia, Caceres, Chile, Las Palmas, New Zealand, and of course the UK, so join our global community and celebrate the world on your doorstep. Over the years many guests staying at Oak House No.1 have been performing at the WOMAD Festival including the amazing ‘Beardy Man’, our luxury hotel in the Cotswolds is the perfect place to relax after a long fun day at the festival. Surely,of all the Cotswolds luxury hotels, Oak House No.1 must be the most ‘rock and roll’. Every summer thousands of concert-goers pack up a picnic, stock up on fizz and join the party in the stunning grounds of Blenheim Palace for the Battle Proms Concert. Come stay at Cotswolds luxury hotel, Oak House No.1 and make a special weekend even more special. Guests can make their special weekend at Oak House No.1 Cotswolds luxury hotel even more special by taking a hot air balloon flight. Just 40 minutes away guests can take the flight of their lives in a hot air balloon, gently floating over the undulating glorious local countryside. Just a day ago we spotted another hot air balloon flying over Tetbury opposite Oak House No.1 (see photo just between the church and the tree). What a perfect way to spend a lazy Sunday afternoon in the glorious Cotswolds countryside watch polo at the nearby Cirencester Park Polo Club, just a few miles from Oak House No.1 Cotswolds luxury hotel. The Tetbury Classic Car Show is on at the Sir William Romney School on the 18th August, raising money for many local good causes. Come stay at Oak House No.1 your luxury hotel in the Cotswolds and bring along your classic car. Prince Charles’s Highgrove shop in Tetbury is just around the corner from Oak House No.1 your luxury hotel in the Cotswolds. The Highgrove shop is Prince Charles’s flagship store and was the very first to open, just around the time we moved to Tetbury ourselves. The store has an amazing range of products to cater for all, including things for the home and garden such as a stylish collection of textiles, kitchenware and garden accessories, inspired by the Royal Gardens at Highgrove. Featuring unique and exclusive pieces, our range includes luxurious soft furnishings, elegant glassware and scented candles infused with the gardens’ evocative fragrances. You can also enhance your outdoor space with our plant and flower collections. There are also a range of things from stationary to food and drink, clothes and even jewellery. The annual Wacky Races and Fun Fair are back in Tetbury, in the Chipping right next to Oak House No.1, luxury hotel in the Cotswolds. The Wacky Races is a great charity fund raising event for local charities and good causes. The town is boosted by 5000 visitors over the weekend, coming not only to take part in the event but also for the food stalls, French market in the high street and many forms of street entertainment. Why not try out falconry during your stay with us at Oak House No.1. Not too far away you can get close up to a range of birds of prey and even try out ‘falconry’ yourself. I tried myself and what an amazing feeling watching a large owl silently glide from high atop a tree and land on your glove. The black pudding at Oak House No.1 Cotswolds luxury hotel we think is the best in the UK. Whilst many Michelin starred chefs tend to favour Stornaway black pudding we prefer one from Dornoch in Scotland. In fact we have run our own test here at Oak House No.1 providing our guests with a taste of each type and 90% of them have agreed that the Dornoch black pudding is their choice. We even had Jimmy Docherty, a great foodie, here (TV’s FOOD UNWRAPPED and Friday Night Feast with Jamie Oliver) and he too agreed that the Oak House No.1 black pudding was excellent. Paul Heaton and Jacqui Abbott are playing at Westonbirt Arboretum this weekend as part of the ‘Forest tour’, why not combine a great concert with a stay at Cotswolds luxury hotel, Oak House No.1. Oak House No.1 is very close to Westonbirt Arboretum and is the perfect place for a special weekend treat and there are still some tickets available. It’s never bland here at Oak House No.1, the decor here is sumptuous and vibrant with plenty of colourful fresh flowers to compliment the rooms. Breakfast each morning is taken sitting at a stunning bespoke made dining table festooned with crystal glasses and silver trinkets, it truly is a feast for the eyes as well as the belly. Nice social times at Oak House No.1 with guests descending here from Singapore, Los Angeles, Dallas and Bombay/Mumbai. Great swapping tales with such interesting and diverse people, not all Cotswolds luxury hotels are like Oak House No.1, a place where you can feel like a treasured house guest in what is truly a home from home environment. Whilst we have hosted billionaires, celebrities, Lords and Ladies at Oak House No.1 everyone is treated just the same and people from all walks of life generally have a nice time together. Our guests at Oak House No.1 are as diverse as the house itself, here’s GB Olympic Gold Medal winners Kate and Helen. Cotswolds luxury hotels are not like Oak House No.1, come enjoy a casual friendly atmosphere in and exceptional place. Here’s owner Gary and Oscar winner Sir Tom Stoppard in the garden, fun times. The UK’s favourite tenor Russell Watson and sister Hayley with us at Oak House No.1, Cotswolds luxury hotels simply do not have the same casual social vibe. Marc Warren with wife Emma and Nicola in the kitchen at Cotswolds luxury hotel, Oak House No.1. Westonbirt Arboretum is just a few minutes away from Oak House No.1 and this is the perfect time of year to see the wonderful splendour of the UK’s largest Japanese Maple collection. Westonbirt Arboretum a few minutes away from Oak House No.1 Cotswolds luxury Hotel. See the UK’s largest Japanese Maple collection in it’s full splendour. High praise indeed from two intrepid world travellers – Oak House No.1’s afternoon tea beats Claridges !!! Well can’t argue with that, guests Rachel & Sivi from Singapore stayed at Claridges the day before and tried their afternoon tea but said that ours at Oak House No.1 was better. All home made by Nicola from delicious cakes to sumptuous savouries. Of all Cotswolds luxury hotels, Oak House No.1 surely provides the most glamorous afternoon tea. Prince Harry & Meghan Markel copy Gary & Nicola’s party outfits from some years earlier. Cotswolds luxury hotel, Oak House No.1’s owners ahead of style again !! Gary & Nicola wearing the same outfits some 3 years earlier at the Better World Awards in Monaco. The Blue Sitting Room at Oak House No.1 has been featured in many interior design magazines from the UK to China, probably the most glamorous of all Cotswolds luxury hotels. Famous TV travel journalist visited Oak House No.1 recently and has featured our Cotswolds luxury hotel in high end Swedish magazine ‘Connoisseur’. The Royal International Air Tattoo commences on the 13th July. Combine a stay at Oak House No.1 our Cotswolds luxury hotel just a few miles away. Not all Cotswolds luxury hotels can say that year after year they are nominated for awards. This year Oak House No.1 has been nominated for a prestigious World Boutique Hotel Award in the category of ‘Inspired Design’. Last year, 2017 Oak House No.1 was shortlisted as the ‘Quirkiest place to stay’ in the UK and the year before the Sunday Times included Oak House No.1, luxury Cotswolds hotel in their 100 ‘Ultimate’ places to stay in the UK. This weekend should be a right royal affair in the Cotswolds,Prince William and Prince Harry are expected to play Polo at The Beaufort Polo Club as part of the Gloucestershire Festival of Polo. Oak House No.1 your luxury 5 star hotel in the Cotswolds is just a few minutes away so make your break special with a little luxury. The Gloucestershire Festival of Polo is once again on the calendar just 1 mile down the road from Cotswolds luxury hotel Oak House No.1. The two-day spectacle, held at the Beaufort Polo Club, includes impressive top class polo, a tented shopping village plus arena attractions and a traditional funfair. Whether you’re a fan of the sport or simply enjoy a great social day out, the Gloucestershire Festival of Polo is not to be missed. Get the date in your diary : Saturday 9th and Sunday 10th June 2018. Afternoon tea can be take in the garden at Oak House No.1, nothing better than relaxing in the Cotswolds on a sunny afternoon. Oak House No.1 luxury hotel in the Cotswolds has seen many fantastic guests cars over the years, but this week saw a very rare Aston Martin indeed. Our latest guest came with his family in one of only three Aston Martin DB6 Estates ever made (he also owned another in the US). I mentioned that we also used to own an interesting Aston Martin Lagonda some 30 years ago to which he replied ” I have a brand new version of the Lagonda waiting to be collected from the factory at Newport Pagnell ( a mere £750,000.00). Well at least we at Oak House No.1 luxury hotel in the Cotswolds has some things in common with the royals, 1. Prince Harry lived just up the road at Highgrove House and 2. the naughty couple copied our outfits for the after party ! Luxury Hotel in the cotswolds, Oak House No.1’s Gary & Nicola wearing Prince Harry and Meghan Markell’s outfits 3 years earlier ! The royal wedding excitement hits Tetbury with the BBC filming right outside Oak House No.1 luxury hotel in the Cotswolds. As Prince Charles lives just up the road at Highgrove House, both Harry and William are visitors to Tetbury, indeed Princess Diana would bring them both as young children to visit the sweetie shops here ! Oak House No.1 here in Tetbury has hosted many well known faces, celebrity guests have included Miranda Hart, Tim Minchin, Kelly Jones of the Stereophonics, Johnny Vegas, Oscar winning playwright Sir Tom Stoppard, Marc Warren (Mad Dogs) and many others. Oak House No.1’s afternoon tea beats Claridge’s afternoon tea. Oak House No.1 your luxury hotel in the Cotswolds. The Library Sitting room with luxury afternoon tea at Oak House No.1 boutique hotel in the Cotswolds. Selected as a luxury Hotel in the Cotswolds, Oak House no.1 is included in the very high end luxury Connoisseur Magazine in Sweden. Food and Travel Magazine named Oak House No.1 as one of the best boutique hotels in the Cotswolds. Situated in the heart of lovely Tetbury, just moments from a choice of good restaurants and known as the antiques centre of the Cotswolds. Princess Anne will present the prizes at The Badminton Horse trials this year. Oak House No.1, your luxury hotel in the Cotswolds is just 15 minutes from Badminton and the perfect destination for this special occasion. Princess Anne , Her Royal Highness the Princess Royal will be attending Badminton Horse trials near to Oak House No.1, luxury Hotel in the Cotswolds. 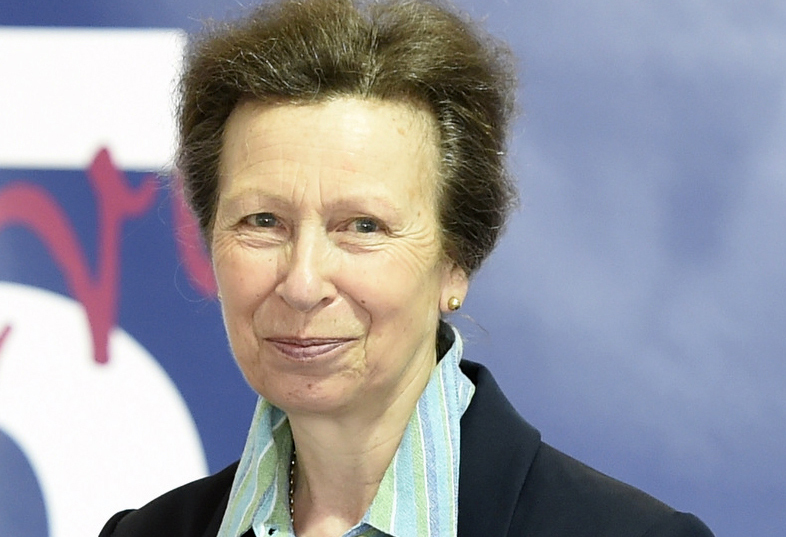 The Mitsubishi Motors Badminton Horse Trials are delighted to announce that Her Royal Highness The Princess Royal will be attending the Event on Sunday May 6th to present the prizes for the world’s greatest Three Day Event. The Princess Royal was a successful competitor at Badminton herself and was followed by her daughter Zara Tindall. If you are thinking of a short luxury break in the beautiful Cotswolds, dates have been announced for you to visit Prince Charles’ Highgrove House and the Highgrove Garden Tour , visit https://www.highgrovegardens.com/visiting-highgrove-gardens/ Our luxury hotel in the Cotswolds, Oak House No.1 is ideally placed here in Tetbury just minutes away from Prince Charles’ wonderful gardens. Lucky Tetbury, a new spa ‘Mayfair & Grace’ has opened www.mayfairandgrace.co.uk ideal for our guests at Oak House No.1 as the spa is a few moments from our door. For a full list of products and treatments please visit their site. From 3rd – 6th May the world class Badminton Horse Trials gets underway just a few minutes down the road for Oak House No.1, luxury hotel in the Cotswolds. Oak House No.1 was recently include in the Sunday Time Travel list as one of the 100 ‘Ultimate’ places to stay in the UK. Better book early for the ever popular Badminton Horse Trials this coming Spring, 3rd – 6th May. Oak House No.1 hotel is ideally placed just 10 minutes away from Badminton. With the excitement surrounding Prince Harry and Ms Meghan Markle’s upcoming wedding, we can’t wait to welcome back Royal wedding florist, Shane Connolly to Highgrove this Spring! Shane holds a Royal Warrant for The Prince of Wales, making him an official supplier of flowers for Royal events – including HRH’s own wedding to The Duchess of Cornwall in 2005, and The Duke and TheDuchess of Cambridge’s nuptials in 2011. So, what better way to spend Valentine’s Day this year than be taught how to ‘Style Your Home for Spring’ by the man who helped to create some of the most romantic moments in Royal history? Royal Wedding Florist at Highgrove House – a day course ! We would like to wish all of our guests,new and returning a very happy New Year. We are looking forward to welcoming you to Oak House No.1, our luxury hotel in the Cotswolds. For that extra touch of luxury a brand new spa has opened in Tetbury, just a hundred yards away, so why not spoil yourself whilst you are staying with us. Oak House no.1 was shortlisted as the Quirkiest Hotel in the UK for 2017. Oak House No.1 luxury hotel in the Cotswolds honoured at the Eviivo awards in London. Award winning Luxury Hotel in the Cotswolds Oak House No.1 – Quirkiest place to stay ? From hundreds of hotels Oak House No.1 has been shortlisted by Eviivo as ‘the Quirkiest place to stay for 2017. Come stay in luxury at Oak House no.1 boutique hotel. Our bathrooms are second to none, all thoroughly modern and cosy but with a huge serving of style. The Cavalier suite with it’s own Library Sitting Room has the most glamorous of all bathrooms with separate rain shower and bath with in wall television, possibly the most glamorous hotel room in the Cotswolds. The trees are already turning at Westonbirt Arboretum and in the coming weeks will begin to show their full Autumn colours. This is a spectacular sight and worthy of a visit, Oak House No.1 is the perfect place to stay if you are looking for a luxury hotel near Westonbirt, we are just 10 minutes away right in the heart of lovely Tetbury. Last week saw Gold medalists and Olympic Champions Kate & Helen Richardson Walsh staying at Oak House No.1. I asked Kate if she would bring their medals along, the girls gladly let guests hold them around the breakfast table one morning. !Oak House No.1 hosts a right royal weekend ! Oak House No.1 may be only a small luxury hotel in the Cotswolds but this weekend hosted some larger than life characters, a Knight of the Realm, a Lady, a Supermodel and an Earl. The wonderful Sir Tom and Lady Stoppard , art dealer Ivor Braka and wife supermodel Kristen Mcmenamy and David, the Earl of Cholmondely. The hospitality textile industry specialist Vision has selected Oak House No.1 for inclusion in this years style guide. Our small luxury hotel in the Cotswolds, Oak House No.1 featured under the category of ‘COLOUR POP’ – not convinced on that title but thanks for the accolade. Our award winning luxury hotel in the Cotswolds, Oak House No.1, has just been honoured again. Hotels Combined have awarded us the ‘Recognition of Excellence’ certificate with a customer satisfaction rating of 9.9. Luxury hotels in the Cotswolds are just not like Oak House No.1, we pride ourselves on a bespoke service to each client in opulent yet homely surroundings. You will not find anywhere to match the levels of luxury in the Cotswolds from luxury bathrobes to silver cutlery and crystal glasses, only the very best will do. Here’s a handwritten tour from us at Oak House No.1 for guests wishing to take in a day trip around the beautiful Cotswolds. From Oak House No.1 here in Tetbury you can take a leisurely drive in a day and see most of what’s so special about the Cotswolds. Prince Charles’s Highgrove House Garden Tour is bookable now, you can choose from a standard tour of his beautiful gardens or make the occasion even more special with the special ‘Champagne afternoon tea tour’. Oak House No.1 is just a few minutes from Highgrove House and is the perfect luxury hotel in the Cotswolds to make your visit extra special. Spring has sprung and the garden at Oak House No.1 is looking splendid. Of course we can’t compete with our neighbour Prince Charles’s Highgrove Gardens, but we have a small oasis here right in the middle of Tetbury. Prince Charles’s Highgrove House is a few minutes away from Oak House No.1 luxury hotel in the Cotswolds. The polo season is underway at Cirencester Park Polo Club just a few minutes away, our membership arrived today and we are looking forward to a great summer at the club. Oak House No.1 guests can visit the club at any time. Your luxury boutique hotel in the Cotswold’s, Oak House no.1 is perfectly placed here in Tetbury. We have some fantastic cars arriving at Oak House No.1, this week was no exception with our guest Luke’s wonderful new Audi R8. Over the years Oak House no.1 has become synonymous with luxury breaks in the Cotswolds and a known destination for guests with super luxury cars. Long may the the tradition continue, here’s few other guests cars which have graced Oak House No.1. A very special anniversary Aston Martin Vanquish at Oak House No.1. One of only a few made. Cirencester Park Polo Club heralds the start of the new season. Oak House No.1 has been a sponsor of the Cirencester Park Polo Club and we are members too, just a few miles from the beautiful grounds of the Duke Bathurst, Oak House No.1 is a perfectly placed luxury hotel in the Cotswolds to make your visit extra special. Great news Camilla, The Duchess of Cornwall is to present prizes at the Badminton Horse Trials. Badminton signs are already going up around Tetbury and Oak House No.1 will soon be welcoming guests from around the globe drawn to the wonderful spectacle. Of all the Luxury Hotels in the Cotswolds, Oak House No.1 is the most conveniently placed for your visit to the Badminton Horse Trials. Spring has sprung, nice to see Tetbury and the countryside around Oak House No.1 in the sun again ! Strong shadows in the garden – summer’s nearly here. We are again looking forward to welcoming clients to our luxury hotel in the Cotswolds, Oak House No.1. Here are some lovely pictures of Tetbury and the beautiful countryside just a minute’s walk from our door. It is the measure of any business that your customers are happy and Trip Advisor is the trusted review site that most travellers find helpful in making a decision where to choose. We are so happy that our customers have a good time at Oak House No.1 and think that the few reviews below help sum up what Oak House No.1 is all about. It’s time to book your accommodation for Badminton Horse Trials, don’t wait as hotels in Tetbury and the nearby villages do get booked up very quickly. We look forward to welcoming you to Oak House No.1. Oak House No.1 is the most luxurious hotel in Tetbury and just minutes away from Highgrove House. Dates have been released for the garden tours, so be quick before they all sell out. Having visited Prince Charles’ gardens in the past, I can really say that this is a special place full of personal memories of Charles and Diana and the children. Many reflections from just one mirror in the hallway at Oak House No.1. So much to see at your luxury hotel in the Cotswolds. Oak House No.1 was proud to donate free nights stays at the Teens Unite charity gala in Covent Garden, London. Our friend Karen Millen (OBE) has worked tirelessly with so many others to help raise funds to assist teenagers coping with cancer. We see a lot of wonderful guests cars here at Oak House No.1 and the Aston Martin Vanquish this week was very special indeed. One of only 6 made with unique features such as gold wheels and trim and even some of the dashboard instruments were made from recycled vintage Aston Martin parts. Oak House No.1 was recently featured in the Sunday Times Travel section, selected as one of the 100 “Ultimate’ hotels in the UK. As one of the few luxury hotels in the Cotswolds, Oak House No.1 is included under the heading of Romantic places to stay. When visiting the Festival of British Eventing do stay at Oak House No.1 your luxury hotel in the Cotswolds, we are just a few minutes away in Tetbury. Whilst staying at your luxury hotel in the Cotswolds, Oak House No.1 you might want to take in one of the many rather strange pastimes that Cotswolds country folk get up to ! The Cotswolds is famous for its stunning scenery, its natural attractions and its quirky events and all within reach of your luxury hotel in the Cotswolds. The Randwick Wap is a traditional event held in the village of Randwick near Stroud. Usually held on the second Saturday in May, this revived ancient festival includes a costumed procession and the ceremonial ‘dunking’ of the mayor in the village pond. Dating back to the Middle Ages, the Randwick Wap has grown to become a major tourist event, attracting visitors from all over the world. The Mayor-elect is presented with a chain of office by his predecessor and the Wap Queen is crowned before they are both carried through the village to cheers from the crowds! The Bibury Duck Race is one of the Cotswolds’ more unusual traditions which attracts visitors from all over England and beyond. Each year on Boxing Day, the sleepy village is transformed as hundreds of spectators from near and far gather along the River Coln, which runs through Bibury. At 11am two races see over 2,000 ducks being unleashed down the river. Each duck can be sponsored for charity. The first 20 ducks and the last duck receive prizes. One of the most unusual events in the Cotswolds, the Bibury Duck Race is a major annual attraction in the village. Celebrating its wool heritage, the Tetbury Wool Sack Races date back hundreds of years. This gruelling event is held on the Spring Bank Holiday Monday at the end of May and involves runners carrying sacks of wool up Gumstool Hill, an extremely steep street in the centre of Tetbury. The men’s wool sacks weigh 60lb and the women’s 35lb. The course runs 240 yards and was originally attempted by young drovers showing off to local women by running up the hill carrying a wool sack. The event is popular with families and also raises money for local causes. 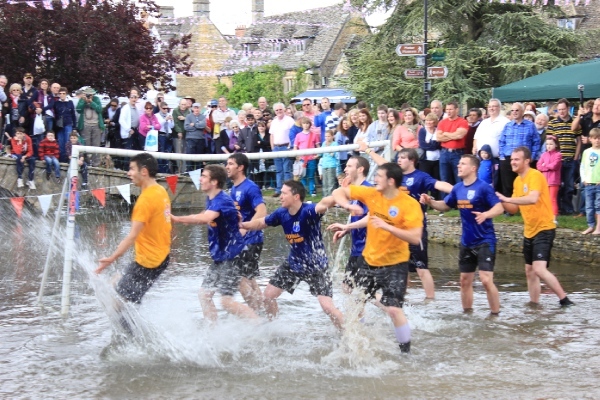 One of the most iconic events in the Cotswolds is the annual football in the river match in Bourton-on-the-Water, held every August Bank Holiday Monday. The usually calm river is disturbed by two athletic teams of players from Bourton Rovers Football Club. 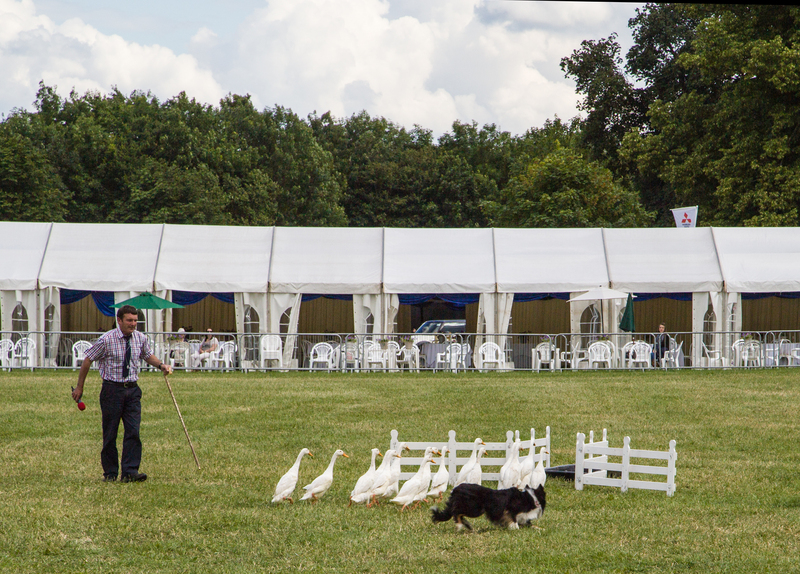 The event dates back over 100 years and attracts thousands of spectators to this picturesque Cotswold village. Goalposts are set up in the river and a qualified referee is in charge. Strangely enough the rules are exactly the same as they are for a normal football match, but the action is much more fun! Probably the wackiest event in the Cotswolds, Cheese Rolling at Cooper’s Hill sees competitors hurtling down a very steep hill in pursuit of a 9lb round of Double Gloucester. Not for the faint-hearted, the Spring Bank Holiday Event run, tumble and stumble over the finish line to claim the cheese as their prize. Competitors from all over the world take part. Due to the steepness and the uneven surface of the hill, a number of injuries are recorded each year. If you are looking to attend a Cotswolds event in late 2015 or 2016, why not rent a luxury self-catering house with Eventful Stays? We specialise in renting out self-catering houses, apartments and cottages close to events in Gloucestershire, the Cotswolds and the UK. The largest festival of its kind in the UK, with folk, blues, rockabilly and more – should be a great festival and just a few minutes away from Oak House No.1 your luxury hotel in the Cotswolds. A celebration of the best beer and cider from near and far – a great event in a classic heritage setting. The 2016 Cotswold Beer Festival will be the 40th, making it one of the longest running CAMRA events. Taste of real English beer in the beautiful Cotswolds countryside not far from your luxury hotel in the Cotswolds, oak House No.1. Why not make Oak House No.1 your luxury hotel in the Cotswolds when visiting WOMAD this year, check out the incredible mixture of talented musicians from all around the world. Remember Cirencester Park Polo Club is just 10 minutes away from us at Oak House No.1 and if you haven’t been to a polo match before it’s a great way to spend a very English Sunday afternoon. We have now finished the league games of the Queen Mother and Non Playing members and have semi finals this afternoon for the 12 Goal and tomorrow for the 6 Goal. In a closely contested tournament last weekend, Cotswold Airport led from the off and secured the trophy. 16:30The Corinium Bowl Final Match details are subject to change. For the most up-to-date games and grounds information and all team players, please see the Polo This Week section on the website or the answer phone message on option 6. The Westonbirt Gardens are open this year every Tuesday, Wednesday and Thursday between 2.00pm and 5.00pm from April – October. No booking is required but you must report to the reception at Westonbirt House with some visual ID. Entry is £5.00. Last entry 4.00pm. The House and Garden Open Days are April – Sun 1oth, May – Sun 1st, June – Sun 19th, July – Sun 17th, Aug – Sun 7th & 21st, Sept – Sun 25th Oct – Sun 23rd. Westonbirt House & Gardens is situated just ten minutes from Oak House No.1 so why not make us your luxury hotel in the Cotswolds whilst enjoying your visit to the gardens. My mate Leo has launched a range of men’s grooming products under the name of Beaufort London, we had a shoot here at Oak House No.1 for his advertising campaign. A luxury hotel in the Cotswolds for a luxury product. We are very happy to be showing sculptures by artist Adam Edwards at Oak House No.1. His latest head sculptures look fantastic in our back garden, though quite modern in style they fit in very well in our traditional Cotswolds garden. Adam studied Fine Art at the famous Saint Martins School of Art in London alongside myself in the late 1970’s. A first for us at Oak House No.1 this weekend saw a guest bring his Morgan Aero, well the showroom’s car until his was finished being built. The owner was off to Blenheim Palace for a gathering of over 400 Morgans, he told us that Blenheim had requested all owners bring a plastic sheet or piece of cardboard to slip under the cars to stop oil dripping on their grass. Doesn’t say much for Morgans ! Polo has begun at the Cirencester Park Polo Club near Oak House No.1 and last week saw Prince William (the Duke of Cambridge) playing for the club again. The beautiful park is just 10 minutes away from Oak House No.1 your luxury hotel in the Cotswolds. Guests at our luxury hotel in the Cotswolds usually want to visit some of the special gardens here in this beautiful region. Kiftsgate is certainly one of the best around, just over the road from the more famous Hidcote House. When the sun is shining there could be no place nicer than an exquisite English country garden and the beauty of a trip to Kiftsgate from Oak House no.1 is that there are many other lovely places to stop at along the way. We have been having great fun trying Michael’s paintings in various spots around Oak House No.1 and they tend to look great everywhere ! The final decision was to put the ‘Bride’ painting in the blue sitting room where it will be seen by so many guests taking afternoon tea. It fits in so well with the blue walls and even the classically upholstered armchair, you see old and new, modern and classic can work well together. Our luxury hotel in the Cotswolds just got better and I can’t wait to see more of his work here in the future. We hosted our oldest ever guest this week, Lei from Tokyo an amazing 84, but acted like a flighty young lady, she was great fun. So stylish too. We are so happy to show some of Michael’s works here at Oak House No.1 and look forward to discussing his wonderful paintings with our many guests. Michael is a self trained ‘Pop Surrealist’, his works fantastical, witty and very playful. Adding even more luxury to our luxury hotel in the Cotswolds. Collected by many including Monty Python’s Terry Gilliam who says that Michael’s work is “Choco block with wit and wonder”. Another collector, Ricky Gervais says “He may be a little mental… But in a good way”. The RAF Royal International Air Tattoo is back at Fairford again this summer so make our luxury hotel in the Cotswolds, Oak House No.1 your base for the best airshow in the world. Johnny Vegas was spotted in Stroud visiting an art gallery. He was staying with us at Oak House No.1 with his lovely wife Irish TV presenter Maia Dunphy. A fun weekend for us at Oak House No.1. Breakfast at Oak House No.1 is a communal affair taken in the dining room around one large table. Surrounded by original artworks by some of the world’s most famous artists,our guests have a lovely time exchanging stories, sometimes long after breakfast has ended. The paintings around Oak House No.1 have been collected from our many trips overseas,below are some of the Indian pictures which were found during a road trip around India 20 years ago. We found a painter working out of a cupboard sized room in Udaipur, bought one painting then returned to the UK and continued to sponsor him to send more paintings to us. I’m sure the artist never imagined his work adorning the traditional walls of this luxury hotel in the Cotswolds. Oak House No.1 has been featured in Esquire magazine (China). Our luxury hotel in the Cotswolds was named the best art hotel in the UK. The accolades for our luxury hotel in the Cotswolds are ever growing, we are so pleased that our Chinese visitors have a great experience with us. The Polo season is underway at the Cirencester Park Polo Club not far from Oak House No.1. Last weekend saw the Warwickshire Cup Final a grand affair at the club with large entertaining marquees for after match revelries, dinner and Champagne, then dancing into the early hours. Oak House No.1 has a long standing relationship with the club and was a sponsor at one time. We are still members and visit as often as we are able, sometimes we loan our membership passes to our guests for a special afternoon in the members area. Oak House No.1 has gained quite a reputation as being more than a boutique hotel in the Cotswolds namely because of the array of original artwork adorning the rooms. There are watercolours from acclaimed artist Christopher Corr, a Grayson Perry Pot and even an original Andy Warhol ‘Queen Elizabeth’ in the dining room. Oak House No.1 isn’t just a place showing off big names but more of an Aladdins cave of hidden treasures found far and wide, there are beautiful paintings found on a drive around India, wonderful pastel drawings by a Cambodian artist found whilst we were living in Bangkok and every corner of the house has yet another gem. No other place could match Oak House No.1 as a luxury hotel in the Cotswolds, here the place has grown organically, not interior designed to any formula and it is this which makes it so special. Oak House No.1 is happy to be showing some of Michael Forbes’ paintings this summer. Michael is a ‘Pop Surrealist’ with a wicked sense of irony and humour. He is already collected by Ricky Gervais and Terry Gilliam amongst many others. I think his work hanging in a classic luxury hotel in the Cotswolds will be a fantastic juxtaposition set against thoroughly English antiques and furnishings. It is a continual theme at Oak House No.1 to change our artworks, keeping the place fresh with new things to see and give artists the opportunity to show their works to our ever changing guest list. We are very proud to be able to show these beautiful and strong head sculptures by Adam Edwards. They are carved from concrete at Adams workshop in Devon and once left in the garden for a few months they look very aged and mottled. Even in the Cotswold garden at Oak House No.1 a rather traditional setting the modern sculptures still work very well. Our friend Karen Millen (OBE), is not only a fashion designer but also a good samaritan too. Karen started her own charity for young people battling cancer called ‘Teens Unite’. Oak House No.1 is so happy to offer up an auction prize of a stay with us on the charity’s grand gala evening later in the year. Here’s a picture of Karen with Woody at Oak House No.1. Last week the Sunday Times Travel journalist visited Oak House No.1 writing a piece on the top- 100 hotels in the UK, which includes our luxury hotel in the Cotswolds. Once we know the date of the publication we will post here on the news page. Oak House No.1 has already appeared in the Sunday Times Style magazine and many other interior design magazines. Nicola & I were invited to Sudeley Castle today – shame about the driving rain,but a pleasant afternoon spent with great history all around – Henry VIII’s wife Queen Katherine Parr lived and is buried there. It’s less than half an hour from Oak House No.1. It’s that time of year again and the Cirencester Park Polo Club is hosting the Warwickshire Cup. It is the most prestigious tournament of the season and a wonderful day out for our guests at Oak House No.1. Just 10 minutes drive away Cirencester Park Polo club is where Prince Charles and William play from time to time and the original rules of Polo originated from the club. If you make Oak House No.1 your luxury hotel in the Cotswolds we can let a lucky couple borrow our personal memberships to the club for a lovely afternoon. Oak House No.1 has been a chosen partner hotel to Cirencester Park Polo Club and we have spent many lazy Sunday afternoons watching some stunning horses thundering around the pitch. So elegant and graceful as are the riders, many from Argentina but also many of the England national Polo team. If you have never been to a polo match the relaxed atmosphere and sheer spectacle make it a worthwhile trip. The Beaufort Polo Club is just a few minutes from Oak House No.1 and this weekend hosts the Gloucestershire Festival of Polo, two days of matches. A weekend celebration ,impressive top-class polo teamed with fantastic entertainment and a tented shopping village ensures a sociable and fun event for all. I have two free Highgrove Garden Tour Tickets worth £50.00 for Wednesday 13th July at 15.25 for anyone booking to stay at Oak House No.1 on the Tuesday or Wednesday 12th or 13th. Please call on o1666 505741 to book your room and reserve your tickets. The polo season has begun again so why not enjoy an afternoon just up the road at Cirencester polo club. Oak House No.1 has long been the choice of the club for many guests attending matches and needing a luxury hotel in the Cotswolds. In the recent past Oak House No.1 was an official partner to the club and we have attended many matches there over the years. It is extra special as both Prince Charles and Prince William play there regularly, what a sight watching them both playing on a Sunday afternoon on beautiful horses in the wonderful setting of the Beaufort estate. This luxury hotel in the Cotswolds has not only been awarded the honour of being one of the best luxury boutique hotels in the Cotswolds but has also been invited to join the prestigious ‘best boutique hotels of the world’ collection. This was a feature about my style and interior design for Esquire Magazine (China), who named Oak House No.1 as the best art hotel in the UK. Oak House No.1 is no run of the mill luxury hotel in the Cotswolds, sure there are luxurious bedrooms with Frette sheets and goose down pillows, flat screen tv’s and ipod docks but this is pretty much standard at this level of hotel. Where Oak House No.1 is very different is that every room has wonderful original artworks and antique furniture,indeed at which other luxury hotel in the Cotswolds would you find a £30,000.00, collectable Mark Brazier Jones chair in your bedroom !? The opulence continues throughout the place with an Andy Warhol ‘Queen Elizabeth’ in the dining room along with a Grayson Perry pot. Oak House No.1 has been named ‘the best Art Hotel’ in the UK by Esquire Magazine (China). Oak House No.1 was featured in Esquire Magazine and named the best art hotel in the UK. We are a small luxury hotel in the Cotswolds and very pleased to receive this accolade. We just had to post this Trip Advisor review as we feel it sums up all that is special about oak House No.1 and written so beautifully. It does help that the guest in question was a professional writer. Oak House No.1 was the perfect luxury hotel in the Cotswolds for two of the most famous Bollywood stars in India today. Karina was telling us that she had made 60 films in just the past 16 years ! As a luxury hotel in the Cotswolds, Oak House No.1 redefines opulence and luxury. Where else would you find original andy Warhol pictures on the walls or Grayson Perry pots just sitting proudly on tables for all to enjoy. There are an array of original artworks in all public rooms and bedrooms, not to mention the quality of everything from original antique furniture,silver cutlery and the finest Frette bed linen the world has to offer. Combine all this with a 100% customer satisfaction rating and Oak House No.1 is the true meaning of a luxury hotel in the Cotswolds, well deserving of it’s award to be included in the top 3% of the world’s hotels for customer satisfaction. There is now a newly built cosy sitting area in the garden of Oak House No.1. This luxury hotel in the Cotswolds just got even better. Oak House No.1 hosted some very glamorous guests for the Badminton Horse Trials. Brigitte and Pascal regular visitors flew their private jet from Holland with 4 friends for the occasion. The garden is looking great at the moment,ideal for our guests afternoon tea at Oak House No.1. Chelsea Flower Show is in full swing and it’s time to get inspired. Away from Tetbury and Oak House No.1 for an evening with friends and relatives in London to attend the preview night of the new exhibition ‘About the Young Idea’ covering the early years of the band in the 1970’s. Nicola & I spent a few days in Monaco as Oak House No.1 sponsored the Better World Awards at the Hermitage, with Jenson Button , Eddie Jordan and Hollywood’s Eva Longoria. What a lovely time spent with these two genuinely nice people,lots of tales,lots of laughs,can’t wait till they return with their latest project their soon to be born baby. Cosy in the dining room for brekky at Oak House No.1 and lots of laughs with James Johnson from the band Biffy Clyro.Good conversation,darts,snooker,footy and music – yep that just about covers all interest groups.Getting right into their stuff,harkening back to Nirvana days past. https://www.youtube.com/watch?v=qpFfoJdvbsQ Just the start of the new year and looking forward to some fun at Oak House No.1, hotel, Tetbury,The Cotswolds. Here’s a picture by Scottish award winning artist Calum Colvin OBE, who we represent her at Oak House No.1. Shown on the upstairs hallway wall. It’s that time of year again and guests staying at Oak House No.1, hotel, Tetbury are flocking to Westonbirt just a few miles down the road. As a boutique hotel,Oak House No.1 generally attracts guests interested in design and art (Oak House No.1, Tetbury was recently named the ‘Best Art Hotel in the UK’ by Esquire Magazine,China), but during the Autumn months most are visitors to Westonbirt. A really nice change for us to meet a very different sort of guest and to talk about something other than the usual ! The Autumn colours at Westonbirt Arboretum this year are particularly spectacular and all guests are returning thoroughly pleased having visited. What a good time we spent with Karen and Ben this weekend,lots of laughs and lots of love for Woody – he loved it all. Two of our guests took a tour around the beautiful Cotswolds villages ending up near Chipping Campden and Kiftsgate Court Gardens.Only 45 mins drive from Oak House No.1 and Tetbury,Kiftsgate is truly a stunning place on a warm sunny English afternoon. Oh what fun we had … I was gifted a chance to take 7 guests and friends of Oak House No.1 to a tour of the Bentley factory in Crewe to see the actual production line. Bentley kindly gave us 5 new Bentleys to drive there and back and provided a wonderful lunch at their HQ. Last week to celebrate the D Day landings a plaque was unveiled by the Mayor just outside Oak House No.1 in the square. It turns out that over 300 US GI’s were stationed in Tetbury during the months leading up to the landings,why, well amazingly just two doors up from us there is a hut called The Maltings’ just in the back garden (now used as a scout hut) where several officers worked in secret on over 200 maps/plans identifying landing points for the invasion.Who would have thought it, a major part of the planning for that day was made right here in Tetbury. What a fantastic party,arranged by Oli Christie last Friday.The event was the official launch of Rock The Cotswolds – thanks Oli The lovely lady and snake were from Seville. The idea,brainchild of Oli Christie of Neon Play in Cirencester (Queen’s Award winner for industry no less) was to highlight the interesting business and people in the region and to hopefully change the preconceptions that the Cotswolds is just a place for red trousered tweedy estate agents ! Candidates were chosen from over 300 nominations for people, businesses and events that Rock the Cotswolds. From these we selected 75, representing some of the cool, creative, innovative and un-Cotswoldy things that you perhaps wouldn’t expect to be happening in the Cotswolds. And this is just the start. Keep nominating and we’ll continue championing the diversity of the Cotswolds where we live, work and play. You can’t pay to be a Rocker. They are chosen because they are great Cotswold ambassadors. Varun Sharma presenter of The ‘Luxury Travel Show’ stayed with us recently. We had a lovely time with him,good wine,exchanged some great tales and heard of his exhaustive travel schedule. Happily he said he would definitely feature Oak House No.1 on one of his TV programmes and also arranged a feature in this Spring’s ‘Asian Wealth Magazine’ – thanks so much Varun. Oak House No.1 closed for a few days – away in Monaco,Nice and St Tropez ahhh. On our return we saw off a bride in a lovely vintage motor. Oak House No.1 has become synonymous with luxury and the new afternoon tea package is the ultimate in luxury with delicious home baked cakes,a selection of sandwiches,quiche, fresh fruit tarts and scones with clotted cream and jam. OakHouse No.1, Hotel, Tetbury is officially affiliated with the SEVEN private members club in Almaty, Kazakhstan. We will be welcoming guests from SEVEN in Kazakhstan,the first exclusive private members club in the region. The club is placed on the top two floors of the new Ritz Carlton Hotel, a stunning new glass tower with equally spectacular views across Almaty to the surrounding snow capped mountain range. We are very privileged to have been chosen as the sole affiliate in the Cotswolds and are looking forward to meeting some interesting new guests. Just look at this view !! Just found this old picture of Charles and Di walking around Tetbury. This picture looks so ‘vintage’, can it be that long ago. Diana would bring the boys to Tetbury to visit the sweetie shop, any little child’s ideal outing ! Combine the experience of hiring a classic car with a luxury break at Oak House No.1 Hotel, Tetbury. Hiring a classic car for that special occasion such as a 40th 50th 60th or 70th birthday present or ruby (ideal with a red car!) or silver wedding anniversary is a unique experience that guarantees to make someone’s dream come true. We can provide Classic Car Hire gift vouchers in the form of a personalised letter. Whether it is for a birthday, anniversary, Valentine celebration, Christmas present or just as a special gift, make a loved one’s dream come true, of enjoying the open road in an Jaguar E–Type, Austin Healey 3000 or MGC Roadster, visit Oxford in a ‘Inspector Morse’ Jaguar MKII or see the delights of the West Country from an Alfa Romeo GTV or Spider. Oak House No.1 hotel has been chosen for inclusion in a great new hotel collection of hand picked special places to stay called ‘Hotel Insider’ , do check it out. We are especially happy to be included on this site as even some Four Seasons Hotels were not chosen to be part of the collection,which shows real dedication to detail by the hotel reviewing panel. The lights were switched on in Tetbury last night and what a lovely sight it was. All the shops in the high street have small Christmas trees mounted above their doors with sparkly christmas lights, windows have been dressed and it all feels very festive. Tetbury is a picture postcard town at the best of times but with the christmas lights Tetbury is just magical. What could be more delightful than spending Christmas right here in the Cotswolds? Idyllic villages covered in a dusting of frost or snow (see Tetbury below), with regular Christmas markets, twinkling lights and a fabulous array of country pubs offering a festive themed beverage and a roaring log fire. In short, the Cotswolds at Christmas are blissful! Oak House No.1 Hotel, Tetbury can provide you with the perfect escape for the festive period. Throughout December there is plenty to do right here in the Cotswolds. So even if you won’t be stopping in the area for Christmas Day itself, you’ll be able to experience the festivity in the air. A Dickensian Christmas at Blenheim Palace, 9 November- 13 December, click here for more information Craft at Christmas at New Brewery Arts, 23 November- 4 January, click here for more information Cirencester Christmas Art and Craft Trail, 28 November, Click here for more information Enchanted Christmas at Westonbirt Arboretum, 29 November- 22 December, click here for more information Britten’s A Ceremony of Carols at Gloucester Cathedral, 8 December, click here for more information Santa Cruises, Gloucester Waterways Museum, 7-8 and 14-24 December, click here fore more information Aladdin at The Everyman Theatre, Cheltenham, 29 November- 5 January, click here for more information Santa Specials on Gloucestershire Warwickshire Railway, selected dates, click here for more information Winchcombe Christmas Festival, 3 December, click here for more information Christmas Crooners at The Roses Theatre, Tewkesbury, 5 December, click here for more information Boxing Day Walks at Batsford Arboretum, 26 December, click here for more information Cotswold Craftsmen, Christmas Exhibition at the Corinium Museum,15 November- 5 January, click here for more information Living Nativity at Cotswolds Farm Park, 1- 22 December, click here for more information Festive Fridays at Batsford Arboretum, 29 November and 6, 13, 20 December, click here for more information Noёl Noёl- a magical evening of classical Christmas favourites, 19 December, click here for more information Santa’s Grotto and real Reindeer at Cotswold Wildlife Park, 14-15 December and 21-24 December, click here for more information Bath Christmas Market This weekend saw guests venturing off to Bath Christmas Market. just 45 minutes from Tetbury. It’s especially Christmassy when it gets dark around 5pm when the beautiful setting of Georgian Bath is lit with colourful Christmas lights. http://www.bathchristmasmarket.co.uk/ Christmas lights switched on in Cirencester 2013 30/11/2013 Keith Chegwin will be turning on the Cirencester Christmas Lights in the Market Place, Cirencester Cheltenham Fashion Week 2013 – Monday 2nd December – Saturday 7th December Cheltenham Fashion Week is back for its second year. Lasting for a whole week it will showcase what Cheltenham has to offer in fashion, hair and beauty as we plug our local talent, independant boutiques, prestigious beauty and hair salons. All whilst allowing Gloucestershire women to come together to watch innovative and exciting catwalk shows, attend VIP parties, drink champagne and shop! http://www.cheltenhamfashionweek.co.uk/ There will be events for all ages and all styles. http://vimeo.com/60083400 Christmas Events at the Corinium Museum Cirencester 2013 Friday 15 November – Sunday 5 January: Cotswold Craftsmen – Christmas Exhibition Explore the wonders of local art and craft in this stunning Christmas exhibition by the Cotswold Craftsmen. The Cotswold craftsmen are a well established group started in the late 1960’s, whose membership is drawn from all around the Cotswolds. The group includes a rich cross section of craftsmen, designers and artists who value the traditions and skills of the past and wish to embrace contemporary techniques and ideas. The aim of the Cotswold Craftsmen is to encourage the making of individual items to a professional standard of design and finish. They value the unique qualities that handmade individually crafted objects possess and recognise the lasting pleasure they bring. This selling exhibition offers the perfect opportunity to pick up a unique gift for family and friends at this seasonal time of year. Tickets: Entry to our temporary exhibition space is free Thursday 5 December: Medieval Christmas Happenings – An afternoon talk with Tim Porter Just because life was hard in the Middle Ages didn’t mean it ground to a halt in the winter. Some of the most important events of the period happened during the festive season – the murder of Becket, the plot to restore Richard II, the coronation of William the Conqueror. This talk by Tim Porter will split equally between some shocking events and the nice ones that took place at Christmas time. Tim will highlight the fact that kings came to Gloucester to celebrate Christmas and the Holy Thorn blossomed at Glastonbury, that’s besides the string of Saint’s days that led to great rejoicing at winter time. Time: 2 – 4pm Tickets: £6 adult or £5.50 for season ticket holders. Includes a hot drink and seasonal mince pie. Booking required. This why we are in Tetbury A recent feature in the Guardian newspaper goes a long way to explain why we feel Tetbury is a great place not only to visit but also to live. “What’s going for it? As a vision of Britain, Tetbury is terribly seductive. I could fall for Tetbury. We could all fall for Tetbury. A town like they used to make them. A town untroubled much by the travails of modern life, like suburbs. A town seemingly composed entirely of the kind of picturesque, biscuit/fudge-coloured Cotswold buildings you see on biscuit tins and fudge packets. A town seemingly without troublesome poor people: Tetbury has been rich since the 15th-century wool trade. A town of antiques shops, boutique B&Bs and purveyors of chutneys and biccies: with cheese shops, butchers, bakers – is that a candlestick maker? – they don’t seem to be in need of Mary Portas round these parts. Yes, that’s Prince Charles’s shop, the Highgrove deli, over there. HRH Charlie is lord of the manor, though, alas, rarely on the tills at the shop. Some say Tetbury inspired Poundbury: both seem to exist in some kind of lovely la-la land”. Tetbury Christmas Lights 2013 Switch On Tetbury Christmas lights will be switched on this year on from 6pm on Thursday 5th December. There will be a torch light procession and community carols filling the streets of Tetbury on the evening of the Christmas Lights Switch On, with live music from The Big Brunch Band, Swindon Brass and Avening Silver band, plus market stalls and late night Christmas shopping. Last year the lights were switched on by HRH Prince Charles and Camilla and this year The Fabulous Baker Brothers, Tom and Henry Herbert, will be flicking the switch this year, filling the streets of Tetbury with twinkly, festive lights. – See more at: http://www.soglos.com/children-family/29572/Tetbury-Christmas-Lights-Switch-On#sthash.K6UuJfMl.dpuf Westonbirt Arboretum near Oak House No.1 presents The Enchanted Christmas A great you Tube video of the Enchanted Christmas at Westonbirt Arboretum, we’ve visited in the past and it is truly magical. http://www.youtube.com/watch?v=wpPubH5ji8U Oak House No.1 Hotel Tetbury – Supports the Thurgood Marshall College Fund at the Hilton Washington D.C Nov 11th 2013 Oak House No.1 Hotel was happy to support the great cause that is the Thurgood Marshall College Fund at the Hilton in Washington D.C. The host for the evening was the legendary comedian Bill Cosby. Oak House No.1 joins a wonderful group of sponsors at the Thurgood Marshall College Fund Gala Event in Washington D.C pdf Highgrove House Christmas Supper from 2nd December 2013 – £55 Highgrove House, Prince Charles’ country home is offering a fabulous festive evening in the beautiful surroundings of the Orchard Room restaurant on Tuesday 10th December. You will be welcomed with warming organic mulled wine and the Highgrove Christmas Shop will be open with some great gift ideas. You will then be invited through to the Orchard Room to enjoy a delicious hearty two-course supper served with mince pies and coffee. Throughout the evening there will be musical entertainment and you will be able to join in singing some favourite Christmas carols. Wine and soft drinks will be available to purchase during the evening. Dress: smart casual. Our Christmas shop will be open between 6 and 6.30pm, with the supper beginning at 6.45pm. Places are limited to 80 per event. Tickets per booking are limited to a maximum of 10 guests. Tables consist of 6 or 10 places. If there are less than six in your party please be aware you will be seated with other guests. After placing your order you will receive admission tickets together with arrival and access information. What a fantastic way to start the Christmas period. The Enchanted Christmas at Westonbirt Arboretum The Enchanted Christmas at Westonbirt Arboretum is a sight to behold. Westonbirt Arboretum’s Enchanted Christmas features a spectacular one mile illuminated trail, highlighting the striking structures of Westonbirt’s trees as they are illuminated against the winter night sky. A new route is created each year to take in different specimens, paths and vistas in the tree collection. Oak House No.1 is just a few minutes away from Westonbirt Arboretum and what has become a yearly favourite event. We have walked the trail with our dog Woody at Christmas when there was snow lining the edges of the magnificent trees and thick on the ground,where the huge coloured beams of light flood the trees in colours ranging from pinks to vibrant oranges and greens the spectacle is magical. We likened it to a magical film set, Narnia came to mind. It makes for a really atmospheric evening out, joining the rest of the Winter revellers, listening to choirs and smelling roasted chestnuts as you go, all so Christmassy. What could be a better way to get in to the spirit of Christmas. Then there’s the restaurant serving all manner of Christmas goodies, just look at the menu below : The Menu… Scrumptious starters: Spiced Carrot, Parsnip & Chestnut Soup. Pork Terrine, homemade chutney and toasted bread. Salmon and horseradish pate with melba toast. Moreish mains: Local Venison & Game suet pudding, mashed potato and braised red cabbage. Escalope of Turkey wrapped in bacon with chipolata sausage, homemade stuffing, roast potatoes, brussel sprouts and turkey gravy. Fillet of Seabass, pan fried and served with new potatoes, pepperonata and balsamic reduction. Homemade gnocchi with creamy forest mushrooms and spinach, finished with crumbled stilton. Vegetables and potatoes will be served per table Perfect puddings: Homemade individual Christmas pudding finished with brandy custard. Chocolate and orange iced parfait with spiced orange compote. Lemon & passionfruit tart with fresh raspberry sauce. Topping it all off with fresh coffees and warm mince pies to finish! The restaurant menu is available at £20 per head. What better way to get that Christmas spirit underway than a perfect Enchanted Christmas at Westonbirt. Autumn Colours 2013 at Westonbirt Arboretum Autumn Colours 2013 at Westonbirt Arboretum has begun, the trees are already ablaze with colour, but be quick what with the heavy winds and storms the fall may be earlier this year. We walk Woody ,our dog, at Westonbirt most days and it is truly beautiful right now, especially the Japanese Maple collection.